Audi commenced its journey to rule the SUV market back in 2005 with Q7. Since then the model received series of updates to win the hearts and walking over the same boulevard, today we have all new Audi Q7 2015, an entirely redesigned version sitting over edge to complete the decade. Let us begin a thorough analysis of updates and powertrains in Audi Q7 2015; A first ever model to debut with the nameplate ‘plug-in hybrid version’. The interior of Audi Q7 2015 is quite spacious than what it looks from outside. Audi Q7 comes with more luggage space, legroom and headspace, making the ride a comfortable experience. Apart from the gifted massive space the upgrades in Audi Q7 2015 includes, seven color combination cricket or Valcona amalgamated with Alcantara, simultaneously aluminum and wood trims can also be noticed glorifying the interior of Audi Q7 2015. Traditional bulky center stack has been now replaced with a taller module subsequently switching the Air conditioning controls to the same altitude as that of instrument cluster, giving space to the display on dashboard. Also as an addition the dashboard is mounted by an all new three spoke steering wheel in front of a digital instrument cluster. Talking about loaded features in Audi Q7 2015, topping the list is 10.1 inch tablet (with an option of two) powered by NVIDIA Tegra 4 processors, as a treat to rear passengers. Tablets are connected to MMI navigation and also providing command over several car functions via WiFi. 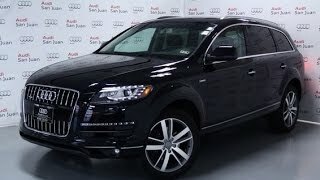 The exterior of Audi Q7 2015 comes with sharper redesigned body lines. However not much of changes can be noticed in making of the exterior. Audi Q7 2015 comes with a huge grille bridging the gap between headlamps and subsequently giving the front fascia a unique appearance. Apart from these, bumper intakes and headlamps carry same glory of some of the recent Audi Models. Moving over to rear fascia of Audi Q7 2015 changes gets a little lesser than that in front fascia, however the one made by narrowing taillights and trapezoidal exhaust pipes makes the rear unique while the traditional Q7 character lines gets neighborhood of sills. · First in the queue is a 2.0 Liter Four Cylinder four cylinder gasoline engine, created for the Asian and U.S markets. The first ever to be mounted in Q7 the four cylinder produces 252 HP and 370 nm torque. 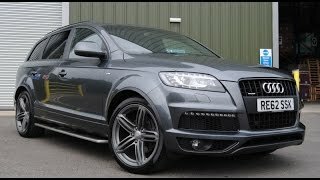 · 3.0 Liter V6 gasoline Engine produces 333 hp and 440 nm torque and enables the Audi Q7 2015 to reach the top speed of 155 mph and covers the 0-62 mph sprint in 6.1 seconds. · Moving ahead to diesel engines the first to knock is previously heard 3.0 liter TDI producing 272 HP and 600 nm torque. The engine is capable of reaching top speed of 145 mph while the 62 mph sprint gets covered in 6.3 seconds. · Last but the most talked about the all new Q7 e-tron, the first ever plug-in hybrid in the house of Audi. The 3.0 liter TDI is paired with a 94 kW to produce a massive 373 hp and 700 nm torque. This way the Audi Q7 2015 turns to be the fastest in line to sprint 62 mph in just 6.0 seconds.